The popular Water Drop Patch Project, co-produced by Girl Scouts of the USA and the Environmental Protection Agency is getting updated and improved. The manual, designed for adults’ use with Girl Scout Brownies through Ambassadors (grades 2-12) and divided into grade-level, age-appropriate watershed activities, now aligns to the new Girl Scout Leadership Experience. Updated information and new and expanded girl-lead, learning by doing help Girl Scouts: discover, connect, and take action. 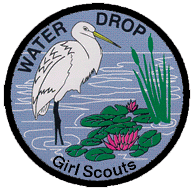 Girl Scouts who complete the requisite number of activities receive a beautiful patch emblazoned with a white egret. Here are some possible activities: Older Girl Scouts (grades six and up) can participate in the International Coastal Cleanup on Saturday, September 20, 2008. This event attracts almost 400,000 volunteers worldwide to pick up trash and marine debris from the nation’s waterways. Girl Scouts (grades 4 and up) can go out and sample the nation’s waters as part of World Water Monitoring Day (September 18th – October 18th.). Both activities are supported by EPA’s Office of Water. Two exciting new activities added to the revised manual include the construction of a rain garden to help control stormwater runoff and the creation of a watershed outreach video. For more information, visit: http://www.epa.gov/adopt/patch/. Free hard copies of the manual can be ordered by calling the National Service Center for Environmental Protection at 1-800-490-9198 or emailing: nscep@bps-lmit.com. (#EPA 840-B-07-001). Patches can be ordered from the GSUSA on-line store http://goshop.girlscouts.org/gsusaonline/ or at Girl Scout council shops. Adults should consult with Safety-Wise to ensure Girl Scout safety guidelines are followed when working with girls. The Water Drop Patch Project is nationally recognized as part of the Girl Scouts? of the USA’s Linking Girls to the Land program.